Given the fact that it's 1st April, (fools day) Big Brother teamed up with Bisola to play a prank on the rest of the Big Brother Naija housemates. Biggie couldn’t have picked a better 'partner' to carry out his April Fools prank on the Housemates! Marvis and Bally fell for it, hook, line and sinker. Efe seemed a little disturbed, while TBoss and Debie-Rise seemed unmoved. This morning, Biggie had HoH Bisola making the other Housemates thinking she had been disqualified. Bisola was called into the Diary Room where she told Biggie her plan to get the others convinced that she had actually contravened the House rules, resulting in Biggie’s decision to disqualify her. She told Biggie that her plan was to walk back into the House crying hysterically and tell the others that she had been disqualified. Indeed, that is exactly what she did. Marvis was first to notice Bisola crying and she immediately started asking her what Biggie had said to her in the Diary Room. Being the actress that she is, Bisola continued crying and mumbling that she had to leave the House, something which Bally, Efe and Marvis couldn’t quite understand and kept asking her to explain more. 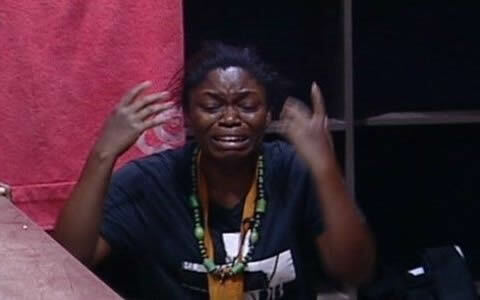 Bisola switched things up a notch by kneeling on the floor and continued crying hysterically. By the time, Bally and Marvis were convinced it was real and even followed her around the House, as she continued crying. Biggie then stepped in, calling all the Housemates into the lounge and playing along first, telling them that Bisola was guilty of infringement, before finally telling them all this was actually an April Fools prank! Marvis was so relieved, she jumped on top of Bisola, hugging her and laughing. Meanwhile, TBoss was heard saying, “I knew it!” The Housemates had a good laugh.